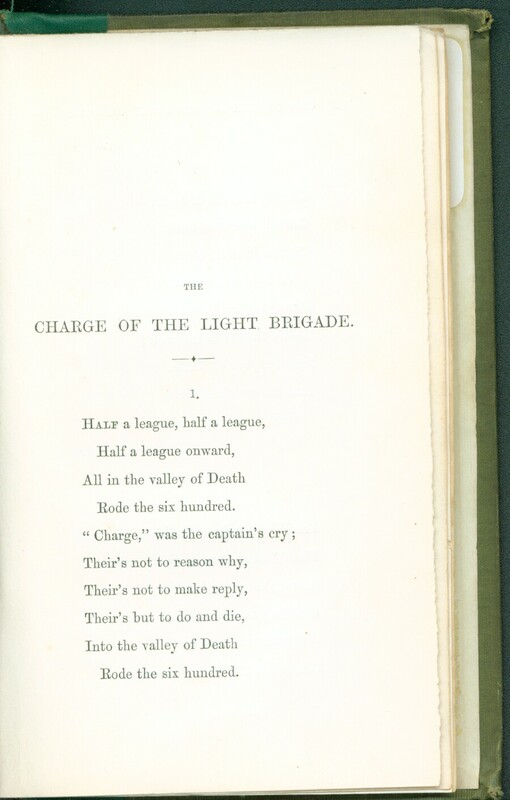 “The Charge of the Light Brigade” is one of Tennyson’s best-known poems (Shannon 2). It was written in the fall of 1854, during the Crimean War, in response to an account of the battle of Balaclava in The Times. During this battle, the British Light Cavalry Brigade was mistakenly ordered to charge a valley held by heavily armed Russian troops in order to recover some guns the Russians had captured. The Brigade of about 700 troops was under heavy fire into the valley and out of it, and most of soldiers were killed (Houston 355–356). When he wrote this poem, Tennyson was already a hugely successful poet, having held the post of Poet Laureate since 1850, the same year that In Memoriam was published (Ricks 219). “The Charge of the Light Brigade” was first published on December 9, 1854 in The Examiner, a weekly newspaper published in London (Houston 356). Circulation figures for that particular issue are not available, but in 1855 The Examiner cost 6d and had a weekly circulation of about 4900 (North). The poem was revised and published in the volume Maud: And Other Poems in 1855. Tennyson changed the end of the poem and edited out the phrase “someone had blundered” and the name of one of the officers (Captain Nolan), which had appeared in the version in The Examiner (Houston 357). The first edition of Maud appeared on July 28, 1855, priced at 5 shillings (“A List of Books” 6). Of the first edition’s run of 10 000 copies, about 8500 were sold by late November 1855. Sales slowed in early 1856, however, and a second edition was not released until later that year (Shannon 10–11). Tennyson reconsidered the changes made to the poem for the Maud volume and revised it once again in August 1855. He changed the ending back to the original one published in The Examiner and restored the line “someone had blundered” (Houston 357). He prepared this final version of the poem at the request of a chaplain from the Society for the Propagation of the Gospel, who mentioned to an acquaintance of a friend of Tennyson’s that the poem was “the greatest favourite of the soldiers—half are singing it & all want to have on black & white—so as to read—what has so taken them” (qtd in Shannon 7–8). Tennyson sent 2000 copies of the poem to the soldiers in pamphlet form. 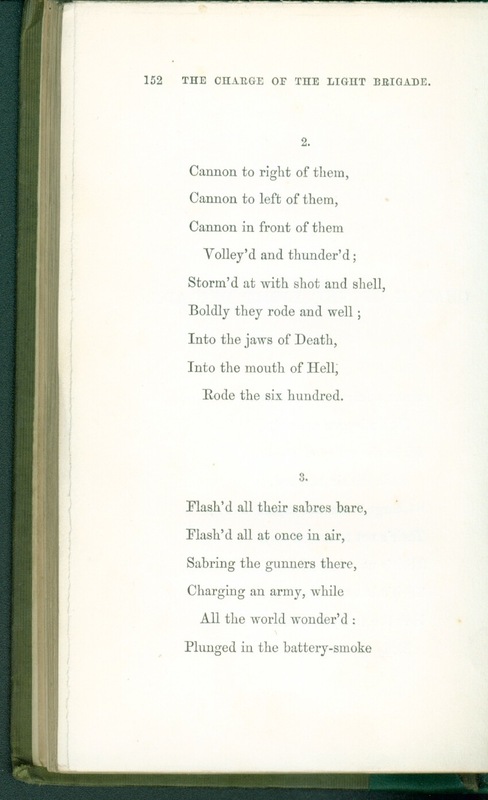 This “soldier’s version” of the poem is generally regarded as authoritative; Tennyson himself wrote in a letter that he was “convinced now after writing it [the poem] out that this is the best version” (Shannon 7–8). “The Charge” was very well known in its own day, and still is today. As “a Victorian recitation anthology favourite” (Camlot 28), it was recited by many children in school. The poem is also famously alluded to in Woolf’s To the Lighthouse (Markovits 496), pointing to the power of its influence over other writers. Another way that the poem has retained its popularity is that the poem was “immortalized” in Tennyson’s voice; a wax cylinder recording of Tennyson reciting the poem survives from 1890, designed as promotion for the Light Brigade Relief Fund, which provided aid to surviving members of the Brigade (Markovits 496). “A List of Books Published by Edward Moxon, Dover Street.” Maud: And Other Poems. By Alfred Tennyson. London: Edward Moxon, Dover Street. 1855. 1–8. Print. Camlot, Jason. “Alfred Tennyson, ‘The Charge of the Light Brigade’ (1854).” Victorian Review 35.1 (Spring 2009). 27–32. Web. JSTOR. 31 Oct. 2013. Houston, Natalie M. “Reading the Victorian Souvenir: Sonnets and Photographs of the Crimean War.” The Yale Journal of Criticism 14.2 (Fall 2001). 353–383. Web. Project Muse. 5 November 2013. “Lord Alfred Tennyson, ‘The Charge of the Light Brigade 1854.’” British Library. N.d. Web. 7 Nov. 2013. Markovits, Stefanie. “Giving Voice to the Crimean War: Tennyson’s ‘Charge’ and Maud’s Battle-song.” Victorian Poetry 47.3 (Fall 2009). 481–503. Web. Project Muse. 5 Nov. 2013. North, John S. “The Examiner.” The Waterloo Directory Of English Newspapers And Periodicals: 1800–1900. Series 2. Waterloo, ON: North Waterloo Academic Press. Web. 31 Oct. 2013. Ricks, Christopher. Tennyson. Basingstoke: Macmillan, 1989. Print. Shannon, Edgar and Ricks, Christopher. “’The Charge of the Light Brigade’: The Creation of a Poem.” Studies in Bibliography 38 (1985). 1–44. Web. JSTOR. 5 Nov. 2013. Tennyson, Alfred. “The Charge of the Light Brigade.” The Examiner 9 December 1854: 780. Web. British Periodicals. 31 Oct. 2013. —. “The Charge of the Light Brigade.” Maud: And Other Poems. London: Edward Moxon, Dover Street. 1855. 151–154. Print. “The Charge of the Light Brigade” in Maud: And Other Poems. Scans taken by me in Special Collections.